The very moment I heard Netflix was making a Bill Murray Christmas Special, and that it would be directed by Sofia Coppola, and guest star the likes of everyone from George Clooney and Chris Rock to Maya Rudolph and Miley Freakin' Cyrus? Yeah, I was definitely on board. I even went and immediately penciled it in (in pen!) on my Best of the Year list. And even though my expectations were through the roof, when it finally premiered this past Saturday, the damn thing managed to pass far above even those impossible expectations. 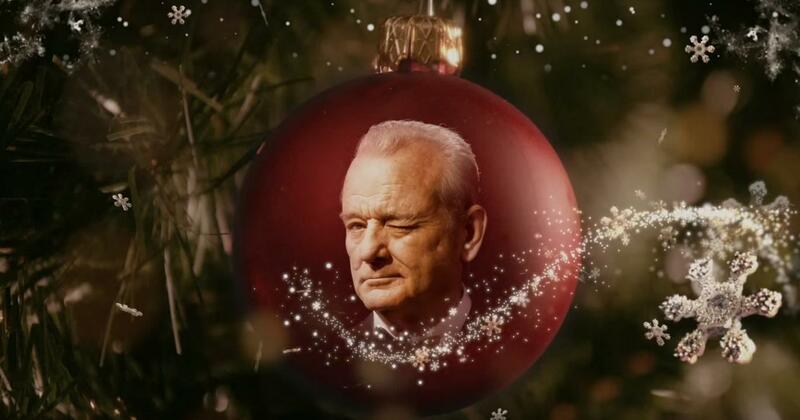 That's right kiddies, A Very Murray Christmas is a very great thing indeed. And yes, "a thing" is the best and most accurate descriptive one can give to this oddly mesmerizing holiday peculiarity. A great and wonderful...thing. Somehow managing to be simultaneously disjointed and perfectly in sync with itself, Coppola has weaved together the most perfectly absurdest trash-to-treasure junkpile of a Christmas special imaginable. And I mean that in the most complimentary way possible. The setting is the Carlyle Hotel in New York, where Bill Murray and Pal Paul Shaffer may or may not be living at the moment. 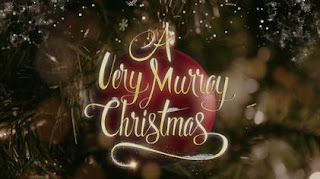 Murray is set to do a live Christmas Eve special, but due to a blizzard raging outside, all of his big name guests have canceled. But thanks to a pair of producers, played by Amy Poehler and Julie White, Murray is forced by contractual obligations to go on with the show anyway, even without his star guest list. Eventually, Murray makes his way to the hotel bar, and this is where the action mostly takes place. This is after one of the highlights of the special, for which there are many, where Murray shanghai's Chris Rock, and forces him to sing a quite hilarious duet of Do You Hear What I Hear?. But it is the hotel bar, and Murray with all his friends, some playing themselves, others playing characters, and still others playing something else completely, where the fun kicks in. From here on in, the special plays at riffing as an exclusive Christmas party for Coppola and Murray and their gang of misfits and rejects - a party we were not invited to, but still managed to sneak in and check out. We get Rashida Jones and Jason Schwartzman (wonder how he got the gig, my lovely wife quipped when he showed up) as a quarreling wouldbe bride and groom whose wedding was canceled due to the aforementioned blizzard. They actually do a lovely little version of Todd Rundgren's I Saw the Light, which is the lone non-holiday song in the show, but one which works well for their characters. Jones, of course, being the daughter of the legendary Quincy Jones, has a sweet yet strong voice, and Schwartzman, cousin of the director and Rushmore co-star of Murray's (that's how he got the gig), though not trained, has a surprisingly melodic voice of his own. Yeah, his talent got him here too, but it's still good to know people. But this is only scratching the surface of this strange strange brew. But what else would, could, and/or should one expect from the minds of Bill Murray and Sofia Coppola? Exactly! We also get David Johansen, former New York Doll and co-star with Murray in Scrooged, as a raspy-voiced bartender, singer-songwriter Jenny Lewis as a tender-voiced waitress, and the French alt-band Phoenix, as the hotel's kitchen crew. Then there is Maya Rudolph. We always knew the girl had chops, but when she belts out Christmas (Baby, Please Come Home), she steals the show. Seriously, she not only belts out this already emotional Christmas tune, she knocks it into the stratosphere. Maya goes all Aretha on the song. Just purely amazing. Another highlight of this portion is the entire barroom gang coming drunkenly together to do an appropriately soused cover of Fairytale of New York. This number leads into the obligatory dream sequence, and the inclusion of George Clooney and Miley Cyrus, the latter of whom proves she can actually get past the attention-grabbing antics of her current career arc, and sing the hell out of Silent Night. And then there is Clooney. I won't get into what Clooney pulls off in his brief appearance with his buddy Bill, as I do not want to spoil the stew, as it were, but let me just say you will not be disappointed. Anyhoo, that's about all I have to say about this most bizarre and most joyous of holiday specials. Now it is your turn to log into Netflix and watch this piece of weirdly magical yuletide fare. Seriously, right now. Go and watch the damn thing! I'll be here when you get done. But for now, that's it gang. See ya 'round the web.